Are you feeling nostalgic for yesteryear? Don’t fret. Virginia entrepreneurs have got you covered with the coolest arcades this side of the galaxy. 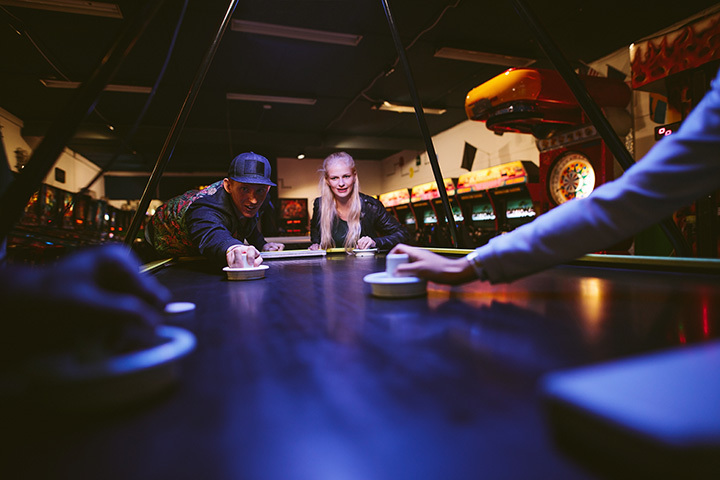 You’ll be busting space invaders, devouring ghosts, and blowing up asteroids faster than you can say, “More quarters, please!” Check out these 10 awesome arcades scattered throughout the state. Firefly isn’t just the hippest place to play video games after a long day in Charlottesville, Virginia, it’s an awesome restaurant and bar, too. Their mission is wholesome: “To provide space for the community to gather.” To accomplish this, they source local ingredients and provide a space to come enjoy the pleasures of yesteryear. Check out the pool table, skee ball, pinball machines, arcade games, foosball, ping-pong, board and card games, and more. Strange Matter is one of Richmond’s most memorable local venues. Not only is the food delicious and the drinks cold, but the live music is unique and makes the video games a bonus. The Strange Matter website has a few choice arcade classics embedded into the page for you to enjoy from the comfort of your home, but come on in to experience the real thing. You’ll always remember an evening spent at Strange Matter. The Zone is the family friendly restaurant and party center in Ashburn, Virginia. The fun doesn’t stop from the minute you enter The Zone. Start with a round of bowling before heading over to laser tag and rounding out the trip with a few games at the arcade. Parents, enjoy a cocktail at the sports bar and order the kids one of the eight Artisan pizzas on the menu. Be warned: You’ll want to come back again and again. Flipper McCoys at the Virginia Beach Oceanfront is a local favorite. Right off the beach at Atlantic Avenue, McCoys offers vintage games and pinball machines. You couldn’t spend a rainy day at the beach better than stopping by Flipper’s. The Cave Gaming Center and Arcade in Fairfax, Virginia is the premier place to get your PC gaming on. Their mission is simple: “Provide the ultimate gaming experience.” Computers and monitors seemingly cover every open space with eager gamers playing the latest online games. Regular tournaments for “Super Smash Bros.” and other games are available. If you’re looking for a more retro experience, this might not be the place for you. But if you want a place to watch the League of Legends Championships, then head on down to The Cave. Ruby’s Arcade in Harrisonburg, Virginia, is one of the newer venues on the list, but is quickly becoming known in the Shenandoah Valley for customer service, great pizza, and awesome games. It’s a more intimate space than the larger game zones on the list, underneath the wonderful Clementine’s restaurant, but don’t let the size fool you; the bowling, pool, darts, and other games make Ruby’s a must visit for any trip to Harrisonburg. FunQuest is your one-stop destination for fun in Lynchburg, Virginia. You want to roller skate? Oh, they got that. Down for a little laser tag? Suit up. Kids want a play place? Start climbing. All of that, in addition to classic arcade games makes FunQuest a no-brainer for a full day of euphoria. Don’t forget to turn in your tickets for some sweet prizes at the end. Central Park Funland in Fredericksburg, Virginia, is newly renovated and ready to go. We recommend the unlimited ride and attraction wristband to truly enjoy this massive campus. Attractions are indoor and outdoor and include laser tag, go-karts, batting cages, mini-bowling, bumper cars, and video games. Group rates are available for large events and birthday parties. With seven acres of outdoor activities to explore, you’ll find yourself coming back to FunLand over and over. The main attraction of the Launching Pad Trampoline Park and Family Fun Center is the trampolines–no big surprise there. But that’s only where the fun begins, as bumper cars, launch tower, and the arcade make up take up the rest of the space and make for an incredible array of unique activities. Special party rates are available. Swaders Sports Park is one of the biggest locations on the list, and definitely one of the most diverse. Attractions include a driving range, bowling, batting cages, two racetracks, mini golf, laser tag, and over seventy arcade games and prizes. Parties and corporate event pricing is available. The Kidzone is open for the youngest among us. Just writing about it makes me want to take a ride out to Prince George!